Tips on Finding and Managing Outbound Telemarketing Services. 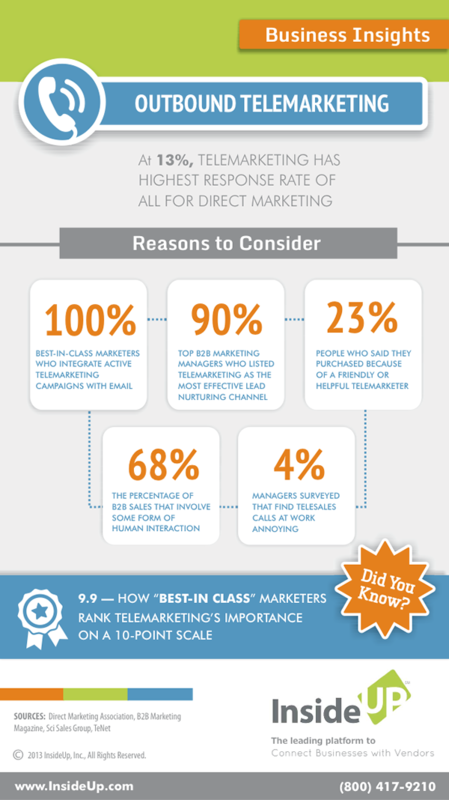 At 13% Telemarketing has the highest response rate of all forms of direct marketing. Reasons to Consider Telemarketing Services. 100% Best in class Marketers who integrate active telemarketing campaigns with email. 90% Top B2B Marketing managers who listed telemarketing as the most effective lead nurturig channel. 23% are the people who said they purchased because of a friendly or helpful telemarketer. 68% The percentage of B2B sales that involve some form of human interaction. 4% Managers surveyed that find telesales calls at work annoying. Should Your Marketing Staff Take a Telemarketing Services Role? Arlette Measures is an online journalist and copywriter, and a leading author on our blogs. She also shares her knowledge of the business to business world through our newsletter articles, white papers, and buyer guides.